In 1999 Herbert Grönemeyer founded the then London-based label Grönland Records to release “Pop 2000”, a sampler consisting of 8 CDs for a television series of the same name, which showed how differently pop from Germany sounded around the turn of the millennium. At the same time, the sampler provided a comprehensive and diverse review of the musical history of Germany. Through his work, Grönemeyer came across the music of the Krautrock legends of Neu! and noticed that it was no longer available. He decided to close this gap. That is how Grönland got to their first signing – and the band of Michael Rother and Klaus Dinger to renewed fame. Between these two poles, the musical history of Germany since the 1970s and contemporary pop music, the label has been oscillating ever since. An approach that has become the philosophy of the independent record company based in Berlin today: elaborate re-issue boxes by artists such as Michael Rother and Holger Czukay (Can) or bands such as Harmonia and DAF stand alongside successful, contemporary pop music such as the likes of Boy, Philipp Poisel, Kat Frankie or newcomers such as Agar Agar and Das Paradies. 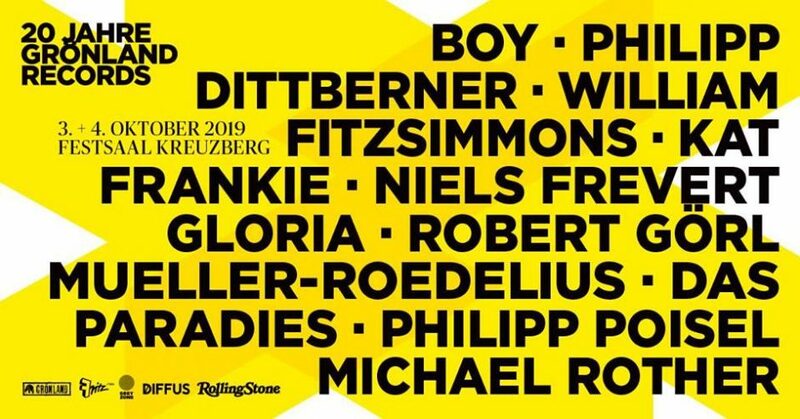 This year Grönland is turning 20 years old and celebrates its anniversary with a big birthday festival, which will bring the label’s versatile catalogue exclusively together on stage at Festsaal Kreuzberg. On two days, Krautrock, Electronica, Singer/Songwriter and German and English-speaking pop will take turns on stage and will once again show the label’s range of activities. Boy, Das Paradies, GLORIA, Kat Frankie, Michael Rother, Mueller_Roedelius, Niels Frevert, Philipp Dittberner, Philipp Poisel, Robert Görl and William Fitzsimmons alternate with their 30-minute sets, some of which are exclusively designed for this evening, to give an impression of what exciting music independent label work can achieve in 2019. With Boy, Das Paradies, GLORIA, Kat Frankie, Michael Rother, Mueller_Roedelius, Niels Frevert, Philipp Dittberner, Philipp Poisel, Robert Görl & William Fitzsimmons.